In 2001, researchers at UCLA described the isolation of a population of adult stem cells, termed Adipose-derived Stem Cells or ASCs, from adipose tissue. This article outlines the isolation of ASCs from lipoaspirates using a manual, enzymatic digestion protocol using collagenase. Zhu, M., Heydarkhan-Hagvall, S., Hedrick, M., Benhaim, P., Zuk, P. Manual Isolation of Adipose-derived Stem Cells from Human Lipoaspirates. J. Vis. Exp. (79), e50585, doi:10.3791/50585 (2013). In 2001, researchers at the University of California, Los Angeles, described the isolation of a new population of adult stem cells from liposuctioned adipose tissue that they initially termed Processed Lipoaspirate Cells or PLA cells. Since then, these stem cells have been renamed as Adipose-derived Stem Cells or ASCs and have gone on to become one of the most popular adult stem cells populations in the fields of stem cell research and regenerative medicine. Thousands of articles now describe the use of ASCs in a variety of regenerative animal models, including bone regeneration, peripheral nerve repair and cardiovascular engineering. Recent articles have begun to describe the myriad of uses for ASCs in the clinic. The protocol shown in this article outlines the basic procedure for manually and enzymatically isolating ASCs from large amounts of lipoaspirates obtained from cosmetic procedures. This protocol can easily be scaled up or down to accommodate the volume of lipoaspirate and can be adapted to isolate ASCs from fat tissue obtained through abdominoplasties and other similar procedures. In 2001, a putative population of multipotent stem cells from adipose tissue was described in the journal Tissue Engineering 1. These cells were given the name Processed Lipoaspirate or PLA cells due to their derivation from processed lipoaspirate tissue obtained through cosmetic surgery. The isolation method described in this article was based on existing enzymatic strategies for the isolation of the stromal vascular fraction (SVF) from adipose tissue 2. The SVF has been defined as a minimally processed population of red blood cells, fibroblasts, endothelial cells, smooth muscle cells, pericytes and pre-adipocytes that have yet to adhere to a tissue culture substrate 2, 3. Culturing of this SVF over time is proposed to eliminate many of these contaminating cell populations and result in an adherent, fibroblastic population. These fibroblasts have been identified in the literature for the last 40 years as being pre-adipocytes. However, our research group demonstrated that these cells possessed mesodermal multipotency and renamed the adherent SVF population as PLA cells. Subsequent studies by numerous other research groups have added to this potential, suggesting both endodermal and ectodermal potentials (for review see 4). Since that time, numerous additional terms for these cells have appeared in the literature. In order to provide some type of consensus, the term Adipose-derived Stem Cells or ASCs was adopted at the 2nd annual IFATS conference. As such, the term ASC will be used in this article. The protocol described in this article is a relatively simple procedure that requires standard laboratory equipment and uses simple reagents such as phospho-buffered saline, standard tissue culture media reagents and collagenase. It can produce large numbers of ASCs depending on the amount of starting adipose tissue volume and subsequent culture time. However, the processing of such a large amount of adipose tissue can present some physical issues that can be mitigated to a degree using this protocol. Furthermore, this protocol does require sterile tissue culture facilities and approved biosafety hoods, thereby necessitating the use of an approved tissue culture facility. This requirement can also decrease the utility of the ASC population in clinical applications unless they are isolated in good manufacturing practice (GMP)-approved facilities designed for the isolation and expansion of materials for clinical use. As an alternative, automated systems that can isolate ASCs in a closed system in the operating theatre would avoid this key issue and allow for the immediate use of ASCs without any need for subsequent in vitro expansion. To date, there are six automated systems that are available commercially for the isolation of cells from human tissue. These systems may make it possible to isolate a significant number of ASCs from large amounts of adipose tissue immediately following its harvest. These ASCs could then be reintroduced into the patient for a variety of regenerative purposes without the patient ever having to leave the operating room. In addition to this protocol describing the manual isolation of ASCs, a protocol for automated isolation of ASCs using the Celution System is also given in a companion article. The protocol shown here describes the manual isolation of ASCs from lipoaspirates obtained through cosmetic procedures using enzymatic digestion and differential centrifugation. This protocol was first published in the journal Tissue Engineering in 2001 1, where the resulting cells were called Processed Lipoaspirate Cells or PLA cells because of their isolation from lipoaspirates. However, the term PLA cell has now been replaced with the term Adipose-derived Stem Cells or ASCs to give the field some sort of conformity in terms of nomenclature. The cells isolated through this protocol have been shown by many to possess mesodermal potential both in vitro and in vivo (for review see 4). In addition, the ectodermal and endodermal potentials of the ASC have also been explored 4. The isolation technique is simple and straightforward and requires approximately one hour to complete. The resulting cells are cultured under standard tissue culture conditions. With culture time, the ASC population becomes more homogenous, comprised of fibroblastic cells that expand easily and show good viability over the long-term in culture. Note: The following pieces of equipment that are required are listed at the end of this article. All glassware, media and reagents should be sterilized through autoclaving or filtered through 0.22 μm filters. Aseptic tissue culture techniques should be followed at all times. To ensure this, all materials placed in the biosafety cabinet should be sterilized by spraying with a 70% ethanol solution and wiping with clean paper towels. Sterile 1X phospho-buffered saline (PBS) for the washing of the lipoaspirates. Prepare approximately 1 L of 1x PBS for every 100 ml of lipoaspirate. Autoclave the PBS and allow to cool to room temperature before use. As an option, antibiotic/antimycotic may be added to a final concentration of: 100 I.U./ml penicillin, 100 μg/ml streptomycin and 2.50 μg/ml amphotericin B once the PBS has cooled. Sterile 0.075-0.1% collagenase type IA (from Clostridium histolyticum) for enzymatic digestion of the lipoaspirate. Concentration will depend on the quality and source of the collagenase - i.e. crude vs. purified. Other collagenase types may be used (e.g. collagenase type II or IV) at similar concentrations. Prepare in 1x PBS and sterile filter using a 1,000 ml filtration system with a 0.22 μm filter (Figure 1A). However, sterile glass bottles fitted with a bottle top filter may also be used. Prepare and use at room temperature. Collagenase solutions may be stored for the short-term at 4 °C until needed. Do not freeze the collagenase solution as it may lessen its activity. Sterile Control Medium (CM) for collagenase inactivation and culturing of the ASC population. For 500 ml of CM, combine the following: 500 ml DMEM (4.5 g/L glucose, with L-glutamine), 50 ml fetal bovine serum (heat inactivated), 5 ml penicillin/streptomycin (10,000 IU penicillin, 10,000 μg/ml streptomycin). As an option, 5 ml amphotericin B (250 μg/ml amphotericin B) may also be added. Sterile filtration of this media is required if non-sterile reagents are used. Place the CM in a 37 °C water bath 30 min prior to use to warm the medium. Sterile glassware and plasticware for isolation. Autoclave a 1,000 ml glass beaker and allow to cool to room temperature before use. In addition, have the following plasticware ready: aseptic serological pipettes (5 ml, 10 ml and 25 ml), 50 ml centrifuge tubes, and tissue culture-treated culture dishes. Most lipoaspirates are collected in an aspiration container (see Figure 1B) and may be comprised of three distinct layers: 1) an upper layer of oil due to the lysis of mature adipocytes, 2) a middle layer of adipose tissue, and 3) a bottom, liquid infranatant containing saline and contaminating cell types such as red blood cells (RBCs). The top oil layer may not be present in significant amounts. If present, it should be aspirated as oil contamination of the resulting ASC culture could affect the viability of the culture. The bottom infranatant should be removed prior to processing to minimize contamination of the ASC cultures with RBCs. This will leave the middle, adipose tissue layer, which will then be washed and enzymatically digested to liberate its cellular, stromal vascular fraction (SVF). Washing the lipoaspirate: Open the lipoaspirate container in the tissue culture hood and carefully decant the lipoaspirate into a sterile 1 L glass beaker. Allow the lipoaspirate layers to separate until the adipose tissue layer is well separated (Figure 1B). Aspirate off the oil layer (if present) using a sterile, glass pipette and the bottom saline infranatant using a 10 ml serological pipette. This will remove the greater majority of contaminating red blood cells and saline. Assess the volume of the resulting adipose tissue layer and add sterile 1x PBS at an equal volume. Stir the aspirate with the pipette used for aspiration in order to mix the lipoaspirate with the PBS. Allow the two layers to settle. As noted above, the 1x PBS may be supplemented with antibiotic/antimycotics. Aspirate the infranatant using a 10 ml serological pipette. Continue to wash the adipose tissue fraction as outlined in steps 2.1.2. and 2.1.3. until the adipose layer has a yellow/gold color. Aspirate the infranatant one last time, leaving the adipose tissue fraction in the glass beaker. To ensure adequate removal of the infranatant, allow the lipoaspirate layers to settle for 5 min after the last wash and before the final aspiration. Enzymatic Digestion of the lipoaspirate: Prepare sterile collagenase 1A solution as outlined above in a filter unit. Prepare a volume equal to that of the adipose fraction and sterile filter. Following filtration of the collagenase solution, discard the upper filter unit, carefully pour the washed adipose fraction into the collagenase solution and tightly close the bottle. Place the collagenase/adipose mixture in a 37 °C water bath and digest at 37 °C for 30 min. Gently swirl the collagenase/adipose mixture every 5-10 min and place back in the water bath. The adipose tissue layer should take on a "smoother" appearance (Figure 1B) as the digestion proceeds. Additional digestion times (i.e. up to 2 hr) can be used if the adipose tissue layer still appears to have solid pieces of fat within it. Isolation of ASCs: Place the digested collagenase/adipose mixture back into the biosafety cabinet. Be sure to sterilize the filter unit with 70% ethanol prior to placing back in the cabinet. Pipette 25 ml aliquots of the infranatant containing the SVF into sterile 50 ml centrifuge tubes. Add 25 ml of CM to each tube. Allow the CM to inactivate the collagenase by incubating at room temperature in the cabinet for 5 min. Centrifuge for 10 min at 1,200 x g to collect the SVF as a pellet. In the biosafety cabinet, aspirate the supernatant from each tube. Ensure the top oil layer and any floating adipocytes are aspirated with this supernatant (Figure 1B). Combine the SVF pellets into one centrifuge tube using 30 ml CM and divide equally over two new 50 ml centrifuge tubes. Centrifuge as in step 2.3.3. and aspirate the supernatants from the two SVF pellets (not shown in Figure). OPTIONAL: If RBC lysis is desired, resuspend each SVF pellet in 10 ml of an RBC lysis buffer (160 mM NH4Cl) and incubate at room temperature for 10 min. Centrifuge as in step 2.3.3. and aspirate the supernatants to yield the SVF pellets (not shown in Figure). Combine the two SVF pellets into one new centrifuge tube using 5-10 ml CM (Figure 1B). To filter out larger tissue particles, pipette the resuspended SVF pellet onto a 100 μm mesh filter placed on top of a new 50 ml centrifuge tube and allow to filter by gravity flow. Pipette aliquots of the resuspended (and filtered) SVF pellet containing the ASCs onto tissue-culture treated culture dishes. Supplement each dish with an appropriate volume of CM. Culture the cells in CM for 3-4 days at 37 °C, 5% CO2 without change of media. Following this initial culture period, the culture media may be aspirated and any contaminating red blood cells gently removed by washing with sterile 1XPBS. Replace with CM and continue to culture the ASCs as needed. The type of tissue culture dish used and how the resuspended SVF pellet is divided among these dishes will depend on the number of cells desired following conventional tissue culture. Once isolated, characterization of the ASC population should be performed. Conventional approaches for this include flow cytometry to characterize the cell surface CD antigen profile of the cells and in vitro differentiation to confirm their multilineage differentiation capacity. While multiple lineages can be assessed in ASCs, this protocol outlines the differentiation of ASCs into cells of the adipogenic, osteogenic and chondrogenic lineages as a means of confirming multilineage mesodermal potentials 5. Osteogenic Differentiation of ASCs: Prior to induction, prepare Osteogenic Medium (OM) as follows: To one 500 ml bottle of DMEM (4.5 g/ml glucose) add 25.0 ml of FBS (5.0% final concentration) and 5.0 ml of penicillin/streptomycin (10,000 I.U/ml and 10,000 mg/ml final concentrations, respectively). To this, add the following osteogenic induction agents to give the indicated final concentrations: Dexamethasone (0.1 μM final), L-Ascorbic acid 2-phosphate (50.0 μM final) and β-glycerophosphate (10.0 mM final). Prior to induction, harvest and plate the cultured ASCs into the desired tissue culture dish so that a confluency of approximately 50% is achieved. For every experimental dish plated, plate an additional dish for a non-induced control. Culture overnight in CM. On the day of induction, remove the medium and add the following: OM to the desired osteogenic experimental wells and CM to the control wells. The volume of media used will depend on the size of the tissue culture dish. For 12 well dishes, 1.0 ml of media per well is sufficient. For 6 well dishes, 2.0 ml of media per well is sufficient. For 100 mm dishes, 10.0 ml of media per dish should be used. Culture the cells for a minimum of 14 days with changes of the appropriate medium every 3-4 days. Highly osteogenic ASC populations may show signs of extracellular mineral deposition as early as 7 days induction. Osteogenic differentiation (i.e. extracellular mineral deposition) may be confirmed using a von Kossa histologic stain for calcium phosphate. This stain will produce a black-brown precipitate identifying the presence of extracellular calcium phosphate (see Figure 2). Fix the cells for 60 min in 4.0% paraformaldehyde prepared in 1x PBS. Wash cells two times with 1x PBS. Incubate the cells with 2.0% silver nitrate (prepared in water) in the dark for 30 min. Remove the silver nitrate, wash two times with distilled water and air-dry the cells. Expose the cells to UV light for 60 min to develop the calcium phosphate precipitate. Wash the cells several times with 1XPBS. Counterstain the cell with hematoxylin if desired. Adipogenic Differentiation of ASCs: Prior to induction, prepare Adipogenic Medium (AM) as follows: To one 500 ml bottle of DMEM (4.5 g/ml glucose) add 50.0 ml of FBS (10.0% final concentration) and 5.0 ml of penicillin/streptomycin (10,000 I.U/ml and 10,000 μg/ml final concentrations, respectively). To this, add the following adipogenic induction agents to give the indicated final concentrations: dexamethasone (1.0 μM final), 3-isobutyl-1-methylxanthine (IBMX - 0.5 mM final), indomethacin (0.2 mM final) and insulin (10.0 μM final). Prior to induction, harvest and plate the cultured ASCs into the desired tissue culture dish so that a confluency of approximately 80% is achieved. For every experimental dish plated, plate an additional dish for a non-induced control. Culture overnight in CM. Note: Adipogenic differentiation of ASCs appears to be more efficient with increased confluency. On the day of induction, remove the medium and add the following: AM to the desired osteogenic experimental wells and CM to the control wells. The volume of media used will depend on the size of the tissue culture dish. For 12 well dishes, 1.0.ml of media per well is sufficient. For 6 well dishes, 2.0 ml of media per well is sufficient. For 100 mm dishes, 10.0 ml of media per dish should be used. Culture the cells for a minimum of 14 days with changes of the appropriate medium every 3-4 days. Highly adipogenic ASC populations may show signs of lipid vacuole formation as early as 7 days induction. ASCs undergoing adipogenic differentiation will develop multiple lipid vacuoles that may be easily visualized under the light microscope. In addition, adipogenic differentiation may be confirmed using an Oil Red O histologic stain that will accumulate within these vacuoles (see Figure 2). Remove the media from the experimental and control cells and fix them for 60 min using a 10% formal calcium fixative. To prepare this fixative, combine the following: 1.0 g of CaCl2, 25.0 ml 16% paraformaldehyde (4.0% final) and 75.0 ml distilled water. Wash the cells two times with 1x PBS. Wash the cells briefly with 70% ethanol. Incubate the cells at room temperature for 5 min with the Oil Red O solution. To prepare the Oil Red O solution, dissolve 2.0 g Oil Red O powder in 50.0 ml 70% ethanol and 50.0 ml acetone. Wash the cells with 70% ethanol and then with tap water. Visualize the cells soon after staining due to fading of the stain with time. Chondrogenic Differentiation of ASCs: Chondrogenic differentiation is achieved through a high-density culture technique referred to as "micromass culture". Prior to culture, prepare Chondrogenic Medium (ChM) as follows: To one 500 ml bottle of DMEM (4.5 g/ml glucose) add 5.0 ml of FBS (1% final concentration) and 5.0 ml of penicillin/streptomycin (10,000 I.U/ml and 10,000 μg/ml final concentrations, respectively). To this, add the following chondrogenic induction agents to give the indicated final concentrations: L-ascorbic-2-phosphate (50.0 μg/ml final), insulin (6.25 μg/ml final), transferrin (6.25 μg/ml final) and TGFβ1 (10.0 ng/ml). Harvest the ASCs and centrifuge for 5 min at 1,200 x g to pellet the cells. Count the cells to determine the density of the cell suspension. To prepare the micromass pellets, prepare two cell suspensions: one experimental suspension prepared in ChM at a density of 1 x 107 cells/ml and one control suspension prepared in CM at a density of 1 x 107 cells/ml. Place 10.0 μl "droplets" of the cellular suspension in individual wells of a multi-well dish. Allow to adhere for 2-3 hr at 37 °C. Gently overlay the plated droplets with either ChM or CM being careful not to dissociate the cells. Culture the cells for up to 14 days in ChM or CM with changes in medium every 3-4 days. Cells cultured in ChM will condense over this time to form a high-density micromass pellet with little to no cells in a surrounding monolayer. Control cells cultured will not undergo this condensation and many will be found as a monolayer. To confirm chondrogenesis, fix the pellets for 15 min in 4.0% paraformaldehyde (prepared in 1x PBS) at room temperature. Stain for the presence of sulfated proteoglycans using an Alcian Blue histologic stain. Wash the paraformaldehyde-fixed pellets once in 1x PBS. Incubate the pellets in 0.1 N HCl (pH 1.0) for 5 min to lower their pH. Remove the HCl and add 1% Alcian blue reagent (prepared in 0.1 N HCl, pH 1.0). Incubate for 30 min at room temperature. Remove the Alcian blue reagent and wash the pellets with 0.1 N HCl (pH 1.0) to remove excess stain. Additional washes using tap water may be used to reduce background staining. As an alternative, the micromass pellets may be harvested, fixed overnight in 10% formalin, embedded in paraffin and the sections stained for Alcian Blue. Characterization of the cell surface CD antigen profile may be accomplished through conventional flow cytometry. Preparation of ASCs for flow cytometry: Prior to analysis, prepare a Flow Cytometry Buffer (FCB) comprised of the following: 1.0% BSA, 2.0% FBS and 0.025% saponin prepared in 1x PBS. Harvest the ASCs and centrifuge the cells for 5 min at 1,200 x g to produce a pellet. Resuspend the cells in sterile 1XPBS and count the cells using a hemocytometer. Determine the cell density of the suspension. Divide the suspension up into aliquots of 5 x 105 cells total and centrifuge to pellet. Remove the PBS supernatant and fix the cells for 60 min at -20 °C with an excess of ice-cold 70% ethanol. If necessary, these cells may be stored in this 70% ethanol in a -20 °C freezer until needed. Add an excess of FCB and gently resuspend the pellet. Centrifuge for 5 min at 1,200 x g to collect the cells as a pellet. Carefully aspirate the FCB supernatant. Remove the final FCB wash supernatant from each aliquot and resuspend in 100 μl of FCB. Add the desired fluorochrome-conjugated primary antibody using the manufacturer's suggested dilution. Incubate the cells on ice with the antibody for 30 min. Note: If fluorochrome-conjugated primary antibodies are not available, non-conjugated primary antibodies may be used. For each fluorochrome used (e.g. FITC, PE), incubate an aliquot of cells with 100 ml FCB containing isotype-matched IgGs as a negative control. Incubate one aliquot in 100 ml FCB containing no antibodies as an additional control. Wash each aliquot of cell two times with FCB as detailed in step 4.1.5. Following the last wash, resuspend the aliquots in 100 ml of FCB and proceed with flow analysis. Note: If non-conjugated primary antibodies were used: Following this wash step incubate the aliquots on ice for 20 min with FCB supplemented with the appropriate fluorochrome-conjugated secondary antibody using the manufacturer's suggested dilution. Wash two times as outlined in step 4.1.5. Flow analysis of ASCs: For flow analysis, a minimum of 10,000 events should be counted. Unstained and isotype-matched controls should be used to set gates by forward scatter (FSC) and side scatter (SSC). For this, the no antibody controls (i.e. unstained) of step 4.1.8 should be used in order to eliminate debris and dead ASCs. The isotype-matched IgG controls of step 4.1.7. should be used to establish areas of positive fluorescence. The protocol outline above describes a manual, enzymatic method for the isolation of an SVF from a large volume lipoaspirate sample. Within this SVF are numerous cell populations, including the ASC. Numerous studies propose that culturing this SVF under standard tissue culture conditions will select for an adherent fibroblast population likely to be composed mainly of the ASC type. Consistent with this, we have shown, using flow cytometry and immunofluorescence, that cultured SVF pellets become essentially free of the major contaminating cells types, namely RBCs, smooth muscle cells and cells of the endothelial lineage 1. The resulting ASC population is relatively homogenous in appearance and comprised of fibroblast-like cells (Figure 2). These adherent ASCs grow well in culture under standard tissue culture conditions and exhibit a moderate population doubling time 1 making them suitable for numerous molecular and cell biology studies in vitro and regenerative studies in vivo. However, in light of the heterogenous nature of the isolated SVF, validation of the ASC population is necessary. Numerous studies have used flow cytometry in order to characterize the CD antigenic profile of cultured ASCs as a potential means of identifying these cells both in vitro and in vivo 5-9. Table 1 summarizes the results from many of these studies. While the expression of some of these CD antigens remains controversial, it is generally agreed that cultured ASCs are CD13, CD29, CD34, CD44, CD49d, CD54, CD90 and CD140a positive. The absence of numerous hematopoietic CD antigens, such as CD31 and CD45, is consistent with the mesodermal origin of ASCs, although the expression of specific hematopoietic markers like CD34 remains unresolved at this time. Recently, ASC antigenic profiles, as determined by flow cytometry, have been used to select for specific subpopulations 10-12 in the hopes of producing ASCs with enhanced differentiation capacities. As the most popular means of validation, in vitro induction of the ASC population using defined culture conditions results in their differentiation into mesodermal, ectodermal and endodermal lineages (for review see 4) (Figure 2). While in vitro tri-germ layer potential has resulted in the use of ASCs for a wide variety of regenerative model systems, differentiation into osteogenic, adipogenic and chondrogenic cells is generally sufficient to identify the ASC and confirm its multipotency. In our hands, the adipogenic differentiation of ASCs results in cells containing bright lipid vacuoles that stain using Oil Red O 5. Osteogenic differentiation results in alkaline phosphatase-positive cells and the accumulation of extracellular mineral that stains using a calcium phosphate Von Kossa Stain 5. Chondrogenic differentiation under high-density micromass conditions produces pellets that contain sulfated proteoglycans (detected using an Alcian Blue stain) and express collagen type 2 5. 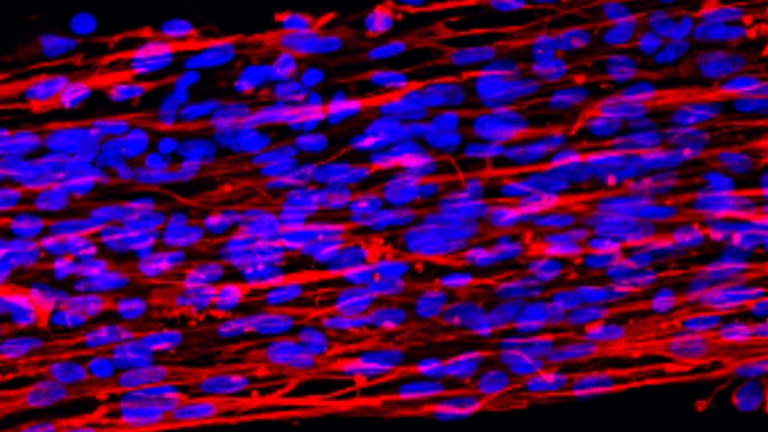 Both skeletal muscle and smooth muscle differentiation can be seen with ASCs staining for skeletal muscle myosin and MyoD1 and smooth muscle actin 5, 13, 14. Differentiation into the ectodermal lineage is suggested through the assumption of a neuronal-like morphology by induced ASCs and the expression of numerous neuronal markers, including that of NeuN, a neuronal transcription factor 5. Finally, induction of ASCs toward a hepatic/endodermal lineage based on established conditions 15 results in cells that expression alpha-fetoprotein, a well-known marker of liver hepatocytes. These markers, together with numerous others published over the last 10 years strongly suggests that the ASC is a pluripotent stem cell population that can be easily maintained and propagated in vitro and induced toward cells of the three embryonic germ lineages. Coupled to their regenerative potentials in vivo (for review see 4), the ASC may be a powerful addition to the tools of a regenerative research scientist or clinician. Figure 1. Manual, enzymatic isolation of human ASCs from lipoaspirate samples. A. Preparation for isolation: Prior to isolation the following components should be prepared: 1) 1x PBS (without calcium or magnesium), sterilized via autoclaving, 2) a solution of 0.075-0.1 % collagenase type IA, prepared in 1x PBS and sterilized through filtration using a 0.22 μm filter unit, 3) Control Medium (CM) for subsequent culture of the ASC population. B. Isolation of ASCs: A step-by-step guide for the isolation of the stromal vascular fraction (SVF)from lipoaspirates is shown. Steps include washing of the lipoaspirate with sterile 1x PBS, digestion using collagenase type IA, collection of the SVF by centrifugation, and SVF filtration. Subsequent culturing of the SVF will result in an adherent fibroblast population containing the ASC population. Click here to view larger figure. Figure 2. Multi-lineage differentiation potential of the adherent ASC population. Cultured SVF cells result in a relatively homogenous population of adherent, fibroblastic ASCs. 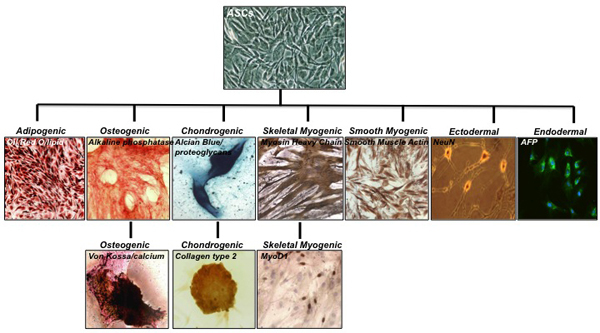 Induction of the ASC population under defined conditions results in cells of the adipogenic, osteogenic, chondrogenic, skeletal myogenic and smooth myogenic lineages. In addition, ASCs may also be differentiated into cells of the ectodermal lineage, expressing NeuN, a marker of neurons and alpha-fetoprotein (AFP) an established marker of the endodermal/hepatic cell lineage. Some histology and immunofluorescent images are taken from previously published results 1,5,6,7,8,9. Differentiation lineage, together with the histologic, immunohistologic or fluorescent stain is shown. Click here to view larger figure. Table 1. Cell surface expression profiles of human ASCs. Adipose tissue for the isolation of ASCs can come in many forms: from solid pieces of tissue obtained through resection or lipoplasty to smaller pieces obtained through either syringe extraction or suction-assisted lipoplasty (i.e. liposuction ). Whether more SVF cells (and thereby ASCs) can be obtained from resected or aspirated adipose samples is unclear as conflicting studies have been presented 16, 17. It is possible that either form of adipose tissue is more than suitable for the isolation of SVF cells and ASCs as long as the operator is proficient in their isolation technique. However, liposuction does hold an advantage over resection in that is it less invasive and requires significantly less post-operative care. While the types of liposuction have increased over the last decade, including techniques, such as ultrasound-assisted, power-assisted and laser-assisted liposuction 18, the most common remains tumescent liposuction, in which the adipose compartment is flooded with large amounts of sterile saline, anesthetics and vasoconstrictors prior to aspiration 19. The choice of technique can vary from surgeon to surgeon. However, while the means of extraction may seem unimportant to the researcher, it is important to realize that the technique may have an effect on ASC number and viability. For example, increasing liposuction vacuum pressure can negatively impact SVF cell yield 20. Moreover, decreases in ASC proliferation have been measured upon ultrasound-assisted liposuction 17. However obtained, the aspirate should be processed quickly as storage temperatures may impact SVF viability and eventual ASC yield. Studies by Matsumoto et al. have shown that ASC yield decreases if the aspirate is stored at room temperature for longer than 24 hr 21. If necessary, 24-hour storage at 4 °C may be used without any deleterious effects on the biologic properties of the ASC population but, again, cell viability can decrease if this storage time is increased beyond that point. The ease of lipoaspirate processing is directly related to its overall volume. Smaller volumes, obtained through syringe extraction, are relatively easy to process. However, larger volume aspirates, obtained through liposuction, can present physical challenges. For example, something as simple transferring the fat from the aspiration container so that it can be washed can present problems when the aspirate volume is large. The protocol outlined in this article is meant to alleviate some of these challenges. By and large, the isolation of ASC populations from lipoaspirates using the enzymatic method described in this article has not changed significantly over the last 10 years. There are numerous protocols available through PubMed that are excellent in their description of the isolation of ASCs from lipoaspirates. Most of them outline a very similar protocol with minor modifications. Basically, the lipoaspirate is washed of contaminants, digested enzymatically to release the SVF and the SVF, containing the ASC population, is collected through centrifugation. Most large volume lipoaspirates arrive in some type of vacuum container - the configuration of which can vary from surgeon to surgeon. This protocol recommends the removal of the aspirate into a large, sterile beaker before washing, since the container itself may be a source of contamination if not properly cleaned before placing in the biosafety hood. Once transferred and allowed to settle by gravity, the aspirate will separate into three layers: a top, oil layer that results from the lysis of mature adipocytes, a middle adipose layer and a bottom layer of saline and contaminating red blood cells. The oil layer should be removed as we have noticed that it may be toxic to the resulting cell cultures (unpublished observations). Also this protocol recommends that the infranatant of saline and RBCs will removed prior to the first wash in order to decrease the potential number of contaminating RBCs once the ASCs are cultured. However, a study by Francis et al. has suggested that this infranatant may also be a source of ASCs 22. The use of a 10 ml serological pipette makes the removal of this infranatant relatively easy. What remains is the adipose layer that can then be easily washed using sterile PBS, or if desired, sterile PBS supplemented with antibiotics and antimycotic to decrease the chance of contamination 23-25. 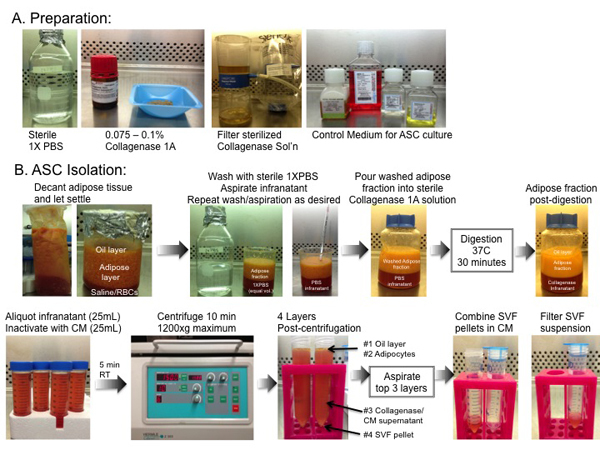 Following washing, the adipose tissue is enzymatically digested using a sterile solution of collagenase type IA. The use of a filtration unit such as the Millipore unit shown in this video combines a convenient means of aseptically filtering the collagenase into a closed container to which the washed adipose tissue can be added for subsequent water-bath digestion at 37 °C. The type of collagenase used has varied from group to group with collagenase type IA seeming to be the more prevalent 1, 24, 25. However, there are over 11 different types of collagenase available commercially, each with digestion affinities for specific tissues. For the digestion of adipose tissue, companies such as Sigma Aldrich recommend collagenase types I and II and both types are well represented in today's literature 1, 24-27. In their original article, Zuk et al. use collagenase type IA obtained from bovine sources at a concentration of 0.075 % 1. However, most commercial sources of collagenase type IA are now obtained from the anaerobic bacteria Clostridium histolyticum or E. coli genetically modified with C. histolyticum genes. Many companies offer numerous preparations of collagenase type IA, from crude to those prepared through ammonium sulfate precipitation. The protocol outlined in this JoVE article uses a crude preparation of type IA collagenase that contains not only collagenase activities, but also non-specific protease, clostripain and tryptic enzymatic activities. While these additional enzymes are critical to digestion efficiency 28, there are those that report lot to lot variability associated with crude collagenase type IA 28, 29 and increase their concentrations of the collagenase up to 0.2% to obtain efficient digestion 23. Those groups using crude collagenase type IA also recommend its supplementation with bovine serum albumin (0.1-1.0% BSA) in order to improve the enzyme's performance and increase the stability of the cells within the adipose matrix. However, this may not be necessary, as the protocol outlined in this article uses collagenase without supplementation with no adverse effect on digestion efficiency. For those wishing to use a more defined collagenase composition, commercial sources containing highly purified collagenase together with a precise blend of proteases are now available. These preparations purify clostridial collagenase types I and II to high activity and combine them with known neutral protease activities, such as dispase and thermolysin. Efficient adipose digestion using collagenase and thermolysin has been reported by Zachar et al.27. In agreement with this work, Pilgaard et al. 30 also report excellent digestion efficiency using several blends of collagenase and thermolysin. However, they do observe better digestion efficiency using preparations of collagenase and dispase. Digestion times for the isolation of cells from adipose tissue can vary from study to study. Many published protocols recommend digestion times of 1-2 hr 27, 30. However, it is important to realize that excessive digestion times may ultimately affect the number of viable ASCs and their stem cell phenotype. Pilgaard and colleagues have determined that 2 hr digestion at 37 °C gives the best balance between tissue dissociation and ASC functionality 30, with Zachar et al. recommending that digestion, past 45 min, be observed every 15 min until 2 hr maximum, with digestion being stopped once the adipose tissue takes on a more homogenous appearance 27. We agree with this recommendation. 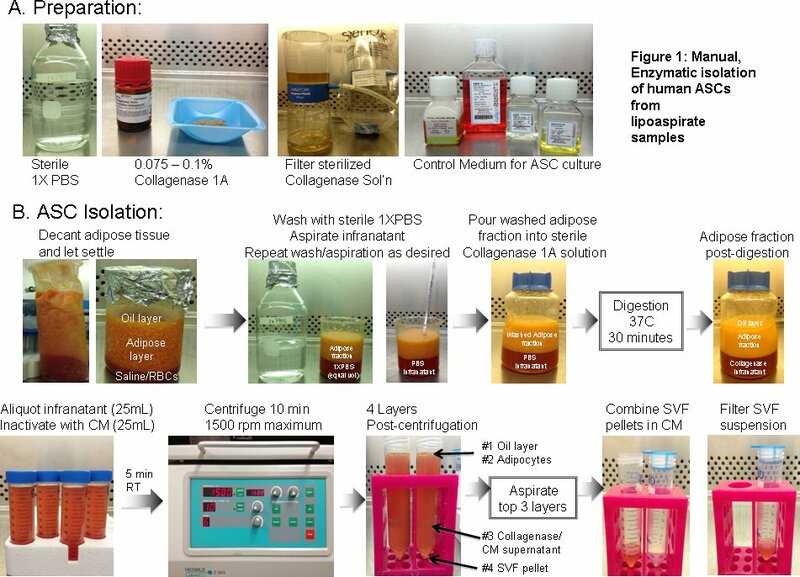 However, it is our experience that most collagenase type IA preparations at 0.075-0.1% are capable of digesting large amounts of lipoaspirates in 30-45 min and that these times are adequate to liberate a sufficient number of cells. Therefore, this protocol recommends a digestion time of 30 min. If more time is required, the consistency of the lipoaspirate should be monitored and digestion stopped when the lipoaspirate assumes a "creamy" or "soupy" appearance (Figure 1). Once the digestion is complete, isolation of the released SVF is simply accomplished using centrifugation. However, like aspiration pressure, the physical effects of centrifugation may have an effect on SVF viability and the number of ASCs available for culture. A study by Kurita and colleagues 31 has shown that speeds in excess of 3,000 x g can damage the ASC. However, speeds should be significant enough to ensure adequate pelleting of the SVF. As a rule, most protocols, including this one, recommend a centrifugation speed of 1,200-1,500 x g. Care should be taken by the researcher to ensure that they understand the relationship between centrifugal force (measured in g) and centrifugation speeds (measured as rpm), as the relationship depends on the specific centrifuge rotor. However, as a rule, lower centrifugal forces, such as 1,200 x g, are often equivalent to centrifugation speed and may safely be used interchangeably. Following spinning, several distinct layers are observed in the centrifuge tube (Figure 1): a top layer of oil and "fluffy" white adipocytes, a middle collagenase layer and a cell pellet. The pellet itself may have two distinct layers: an upper layer of RBCs and a lower white SVF pellet, containing the ASCs. This protocol recommends the careful aspiration of the oil and adipocytes, as the oil may be toxic to the cell culture and adipocytes have been shown to be capable of dedifferentiation back to a more primitive cell type 32. However, these adipocytes may be harvested at this point if desired. Because of these contaminants, this protocol recommends an extra washing step to ensure their adequate removal. This step also allows the researcher to combine multiple SVF pellets for subsequent ease of filtration. Filtration is likely to be necessary due to the presence of large pieces of fibrotic material and cellular aggregates following digestion. These materials are easily removed through simple gravity-based filtration through 70 or 100 µm mesh filters. An aliquot of the filtrate may be taken in order to count the number of nucleated cells if desired and the remaining filtrate plated for ASC adherence and expansion. Despite diligent attempts to remove as many RBCs as possible, no ASC preparation will be totally without RBC contamination. In our original article, we proposed the removal of these RBCs through resuspension of the pellet in a hypotonic solution of 160 mM NH4Cl. The majority of subsequent isolation articles contain this step and recommend the use of NH4Cl-based solutions or sterile water 22-24, 27, 33, although care must be taken if using sterile water, to minimize the time the SVF cells are exposed to the hypotonic solution 27. However, this step may not be necessary as RBCs are a non-adherent cell population and can easily be removed following an overnight culture of the ASC population. Moreover, while anecdotal at best, these RBCs appear to improve the initial expansion of the resulting adherent cells (Zuk, unpublished observations). As such, this protocol eliminates the RBC lysis step and proposes that the initial ASC cultures be allowed to expand in the presence of these RBCs for the first 3-4 days without any change of culture medium. The reason for this observation may be due to some type of paracrine signaling from contaminating blood cells or may simply be due to better viability with the exclusion of the RBC lysis step. Following this, the culture medium can be aspirated and the majority of RBCs removed by gently washing the plates with sterile 1x PBS. Over time, any remaining RBCs will eventually die and be removed from the culture. Studies by Zachar and Boquest have estimated that 25-50% of the resuspended SVF pellet adheres to tissue culture plastic 23, 27. The resulting "passage 0" ASC cultures are heterogeneous, comprised of small, round cells thought to be ASCs and more irregularly shaped cells proposed to be endothelial in origin. While studies by many groups including ours have confirmed the absence of contaminating cell types such as SMCs, hematopoietic cells and fibroblasts in ASC cultures 1, the presence of additional cell types cannot be ruled out. Indeed, Tallone et al. has characterized passage 0 cultures and observed four distinct populations: 1) small, round, rapidly renewing cells, 2) spindle-shaped fibroblastic cells thought to be the ASC, 3) slowly replicating large cells with a more restricted potential (i.e. pre-adipocytes) and 4) cuboidal endothelial cells that are lost with passage 34. Subsequent studies have shown that the round, rapidly renewing cell population possesses the highest multipotentiality and express typical stem cell markers 35, 36. Moreover, they may form "spheroids" due to their rapid proliferation and are often surrounded by spindle-shaped fibroblasts. As such, it is possible that the spindle shaped ASC population proposed above may originate from these cells. Following initial expansion of these passage 0 ASC cultures, it is thought that continued culturing over time selects for the ASC, with the resulting cultures assuming a more fibroblastic, homogenous composition. However, remnants of contaminating cells cannot be totally ruled out and, therefore, the ASC population should still be considered heterogeneous. While the protocol described in this article is straightforward, inexpensive and does not require any pieces of equipment not normally found in a tissue culture facility, it does have the disadvantage of requiring such a facility. Numerous studies have investigated the translational applications of ASCs through animal models and clinical studies using the ASC have begun to appear (for review see 4). However, their utility is limited by the need to remove the lipoaspirate from the OR in order to obtain the ASC. In response to this, there has been a call for the development of closed-systems capable of aseptically isolating ASCs from adipose tissue directly in the OR. These systems would offer the advantages of speed and consistency, with minimal input from a manual operator. In a companion article we plan to describe the use of such an automated system and compare its utility to that of manual isolation techniques. The authors of this manuscript are co-inventors on a patent owned by The Regents of the University of California and licensed to Cytori Therapeutics. The authors wish to acknowledge and thank those additional research personnel that contributed to the development of the described protocol and its isolation of ASCs, including: Dr. H. Peter Lorenz, MD, Dr. Hiroshi Muzuno, MD, Dr. Jerry Huang, MD, Dr. Adam Katz, MD, Dr. William Futrell, MD, Dr. Rong Zhang, DDS, PhD, Dr. Larissa Rodriguez, MD, Dr. Zeni Alfonso, PhD, and Dr. John Fraser, PhD. The results presented were funded, in part, by research grants from the National Institutes of Health, including the NIAMS and NIDCR Institutes. Zuk, P. A., et al. Multi-lineage cells from human adipose tissue: implications for cell-based therapies. Tissue Engineering. 7, (2), 211-226 (2001). Rodbell, M. Metabolism of isolated fat cells. J. Biol. Chem. 239, 375-380 (1964). Poznanski, W. J., Waheed, I., Human Van, R. fat cell precursors. Morphologic and metabolic differentiation in culture. Lab Invest. 29, (5), 570-576 (1973). Zuk, P. A. Adipose-derived Stem Cells in Tissue Regeneration: A Review. ISRN Stem Cells. in press (2012). Zuk, P. A., et al. Human adipose tissue is a source of multipotent stem cells. Mol. Biol. Cell. 13, 4279-4295 (2002). Mitchell, J. B., et al. Immunophenotype of human adipose-derived cells: temporal changes in stromal-associated and stem cell-associated markers. Stem Cells. 24, (2), 376-385 (2006). Oedayrajsingh-Varma, M. J., et al. Phenotypical and functional characterization of freshly isolated adipose tissue-derived stem cells. Stem Cells Dev. 16, (1), 91-104 (2007). Yoshimura, K., et al. Characterization of freshly isolated and cultured cells derived from the fatty and fluid portions of liposuction aspirates. J Cell Physiol. 208, (1), 64-76 (2006). Zannettino, A. C., et al. Multipotential human adipose-derived stromal stem cells exhibit a perivascular phenotype in vitro and in vivo. J Cell Physiol. 214, (2), 413-421 (2008). Chung, M. T., et al. CD90 (Thy-1) Positive Selection Enhances Osteogenic Capacity of Human Adipose-Derived Stromal Cells. Tissue Eng Part A. (2012). Li, H., et al. Adipogenic potential of adipose stem cell subpopulations. Plast Reconstr Surg. 128, (3), 663-672 (2011). Rada, T., Reis, R. L., Gomes, M. E. Distinct stem cells subpopulations isolated from human adipose tissue exhibit different chondrogenic and osteogenic differentiation potential. Stem Cell Rev. 7, (1), 64-76 (2011). Heydarkhan-Hagvall, S., et al. Human Adipose Stem Cells: A Potential Cell Source for Cardiovascular Tissue Engineering. Cells Tissues Organs. 187, (4), 263-274 (2008). Jack, G. S., et al. Processed lipoaspirate cells for tissue engineering of the lower urinary tract: implications for the treatment of stress urinary incontinence and bladder reconstruction. J Urol. 174, (5), 2041-2045 (2005). Banas, A., et al. Rapid hepatic fate specification of adipose-derived stem cells and their therapeutic potential for liver failure. J Gastroenterol Hepatol. 24, (1), 70-77 (2009). Schreml, S., et al. Harvesting human adipose tissue-derived adult stem cells: resection versus liposuction. Cytotherapy. 11, (7), 947-957 (2009). Oedayrajsingh-Varma, M. J., et al. Adipose tissue-derived mesenchymal stem cell yield and growth characteristics are affected by the tissue-harvesting procedure. Cytotherapy. 8, (2), 166-177 (2006). Ahmad, J., Eaves, F. F., Rohrich, R. J. 3rd, Kenkel, J. M. The American Society for Aesthetic Plastic Surgery (ASAPS) survey: current trends in liposuction. Aesthet Surg J. 31, (2), 214-224 (2011). Tierney, E. P., Kouba, D. J., Hanke, C. W. Safety of tumescent and laser-assisted liposuction: review of the literature. J Drugs Dermatol. 10, (12), 1363-1369 (2012). Mojallal, A., Auxenfans, C., Lequeux, C., Braye, F., Damour, O. Influence of negative pressure when harvesting adipose tissue on cell yield of the stromal-vascular fraction. Biomed Mater Eng. 18, (4-5), 193-197 (2008). Matsumoto, D., et al. Influences of preservation at various temperatures on liposuction aspirates. Plast Reconstr Surg. 120, (6), 1510-1517 (2007). Francis, M. P., Sachs, P. C., Elmore, L. W., Holt, S. E. Isolating adipose-derived mesenchymal stem cells from lipoaspirate blood and saline fraction. Organogenesis. 6, (1), 11-14 (2010). Boquest, A. C., Shahdadfar, A., Brinchmann, J. E., Collas, P. Isolation of stromal stem cells from human adipose tissue. Methods Mol Biol. 325, 35-46 (2006). Bunnell, B. A., Flaat, M., Gagliardi, C., Patel, B., Ripoll, C. Adipose-derived stem cells: isolation, expansion and differentiation. Methods. 45, (2), 115-120 (2008). Dubois, S. G., et al. Isolation of human adipose-derived stem cells from biopsies and liposuction specimens. Methods Mol Biol. 449, 69-79 (2008). Mosna, F., Sensebe, L., Krampera, M. Human bone marrow and adipose tissue mesenchymal stem cells: a user's guide. Stem Cells Dev. 19, (10), 1449-1470 (2010). Zachar, V., Rasmussen, J. G., Fink, T. Isolation and growth of adipose tissue-derived stem cells. Methods Mol Biol. 698, 37-49 (2011). Williams, S. K., McKenney, S., Jarrell, B. E. Collagenase lot selection and purification for adipose tissue digestion. Cell Transplant. 4, (3), 281-289 (1995). Wang, H., Van Blitterswijk, C. A., Bertrand-De Haas, M., Schuurman, A. H., Lamme, E. N. Improved enzymatic isolation of fibroblasts for the creation of autologous skin substitutes. In Vitro Cell Dev Biol Anim. 40, (8-9), 268-277 (2004). Pilgaard, L., Lund, P., Rasmussen, J. G., Fink, T., Zachar, V. Comparative analysis of highly defined proteases for the isolation of adipose tissue-derived stem cells. Regen Med. 3, (5), 705-715 (2008). Kurita, M., et al. Influences of centrifugation on cells and tissues in liposuction aspirates: optimized centrifugation for lipotransfer and cell isolation. Plast Reconstr Surg. 121, (3), 1033-1041 (2008). Poloni, A., et al. Human dedifferentiated adipocytes show similar properties to bone marrow-derived mesenchymal stem cells. Stem Cells. 30, (5), 965-974 (2012). D'Andrea, F., et al. Large-scale production of human adipose tissue from stem cells: a new tool for regenerative medicine and tissue banking. Tissue Eng Part C Methods. 14, (3), 233-242 (2008). Tallone, T., et al. Adult human adipose tissue contains several types of multipotent cells. J Cardiovasc Transl Res. 4, (2), 200-210 (2011). De Francesco, F., et al. Human CD34/CD90 ASCs are capable of growing as sphere clusters, producing high levels of VEGF and forming capillaries. PLoS One. 4, (8), e6537 (2009). Haasters, F., et al. Morphological and immunocytochemical characteristics indicate the yield of early progenitors and represent a quality control for human mesenchymal stem cell culturing. J Anat. 214, (5), 759-767 (2009). Hello, I´m an psot graduation student from Brazil and this paper and video would help me a lot! So, can anyone tell me how can I get it? I didn´t find a place to pay and I dont know if I will get it through the university.